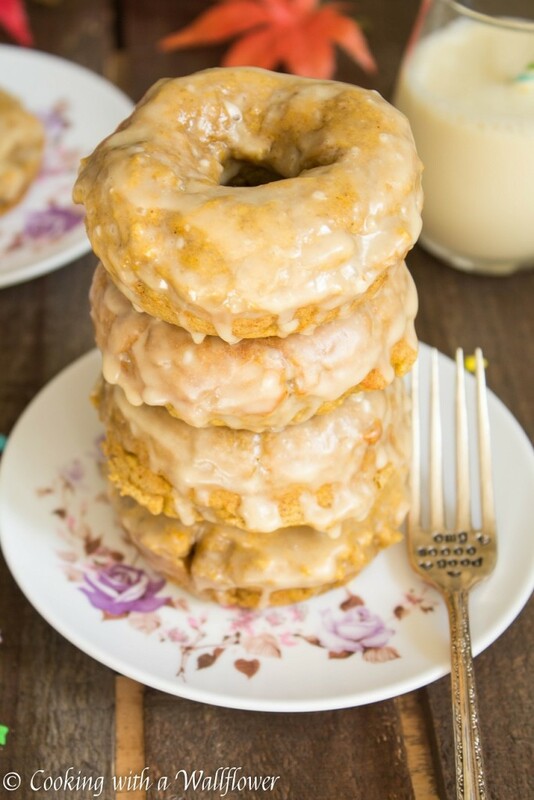 Slightly sweetened baked pumpkin donuts dipped in maple glaze. 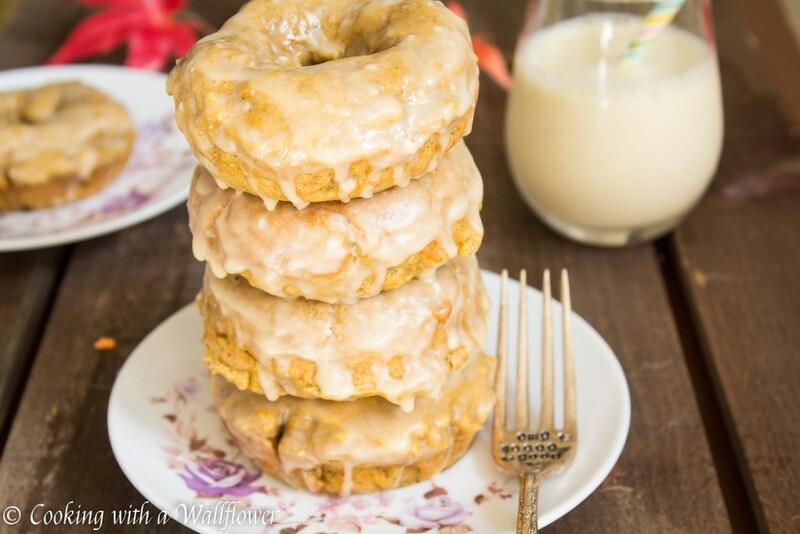 These baked pumpkin doughnuts with maple glaze are a great option for breakfast or dessert. I hope you had a fantastic Halloween! We had tons of trick-or-treaters ringing our doorbell last night. I completely forgot that Halloween fell on a Saturday this year which means that more kids are out and about. Thankfully we had enough treats for everyone! And for those of you who live in the U.S., how are you adjusting to Daylights Savings? I swear, it always throws me off. 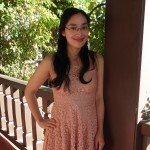 I enjoyed the extra hour in the day, but still, I really don’t like that it gets dark so much faster now. I mean, the sun disappears before it’s even 5! Okay, so, with the holidays around the corner, like literally, I wanted to venture more into baking. Baked goods are always great for breakfast and as gifts for family, friends, and coworkers so I wanted to test out a few more seasonal baked goods recipes. About two weeks ago, I decided to order this doughnut pan. I love that it makes only six so I wouldn’t have too many doughnuts waiting around to be eaten, and they’re pretty inexpensive. 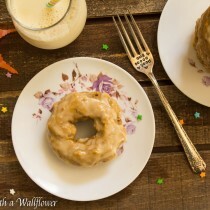 I’ve always had a weak spot for doughnuts despite how terrible they are for you, and I thought it would be fun to try to make some at home. 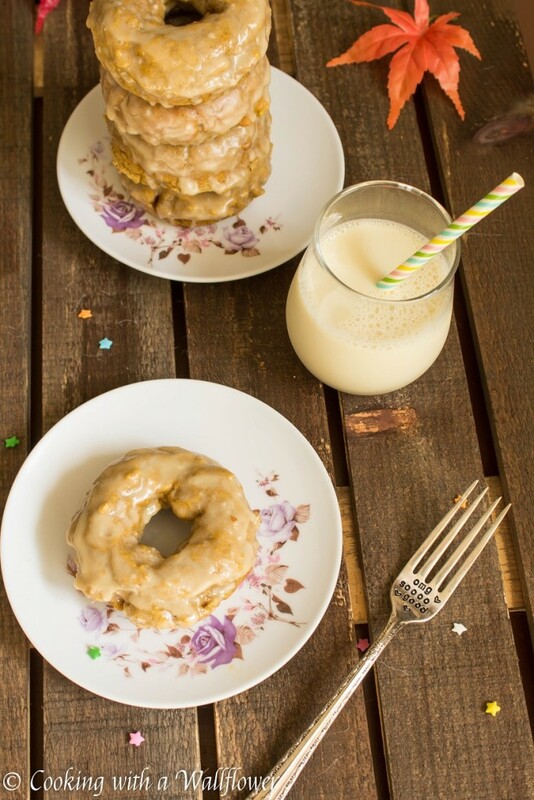 By baking the doughnuts rather than frying them, these homemade doughnuts are bound to be healthier, right? 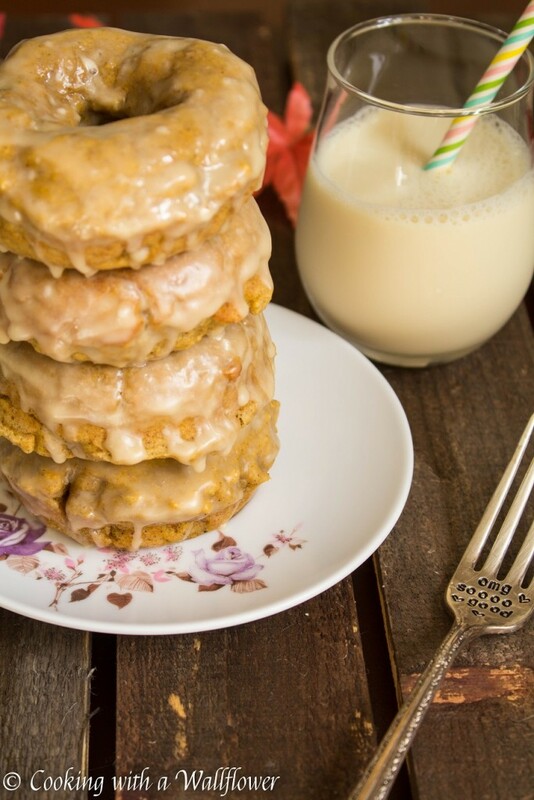 These doughnuts don’t require too many ingredients. They’re cakey, slightly sweetened, and super easy to make. Plus they’re filled with pumpkin and pumpkin pie spices. Once they’ve had a chance to cool after they’ve come out of the oven, you can dunk them in a bowl of sugary maple goodness. How is that for embodying the flavors of fall? Preheat the oven to 350F. Lightly grease the doughnut pan with nonstick cooking spray, or with vegetable oil. Set the pan aside for now. In a small bowl, whisk together the powdered sugar, milk, and maple syrup until they are well combined. 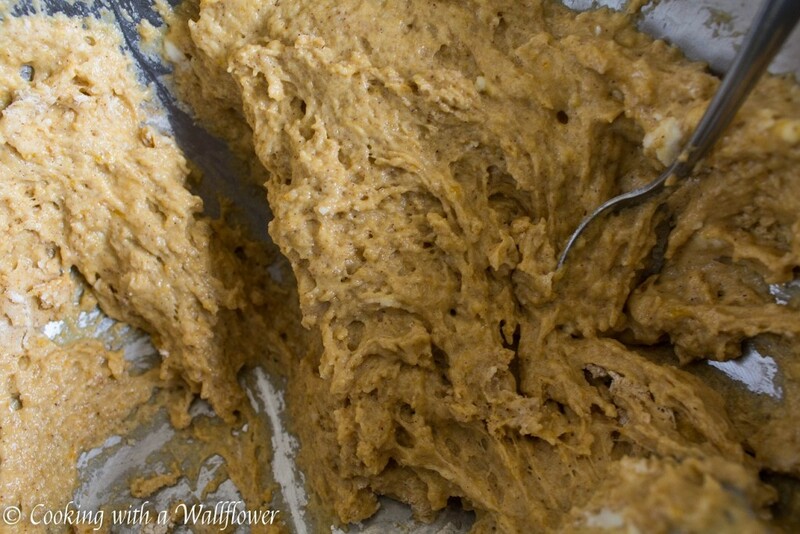 In a medium sized bowl, mix together all purpose flour, baking soda, baking powder, and pumpkin pie spice. I used the premade pumpkin pie spice because I already had it on hand, but you can make your own by following this recipe. In a separate bowl, whisk together the egg, brown sugar, soy milk, and pumpkin puree together until they become smooth. Add melted butter and vanilla extract, and whisk until they are combined. Pour the wet ingredients into the dry ingredients, mixing until they are just combined. Make sure that you don’t overmix. 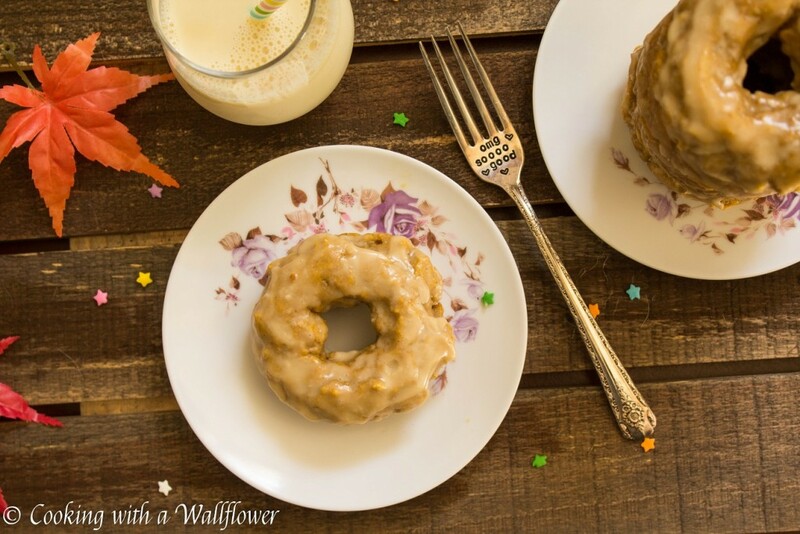 Use a small spoon to place the batter into the doughnut pan, filling the cavities up to 2/3 -3/4 high. If you don’t have a doughnut pan, no worries. You can evenly divide the batter into a muffin tin, about 6-8, and bake for 18-20 minutes at 350F. 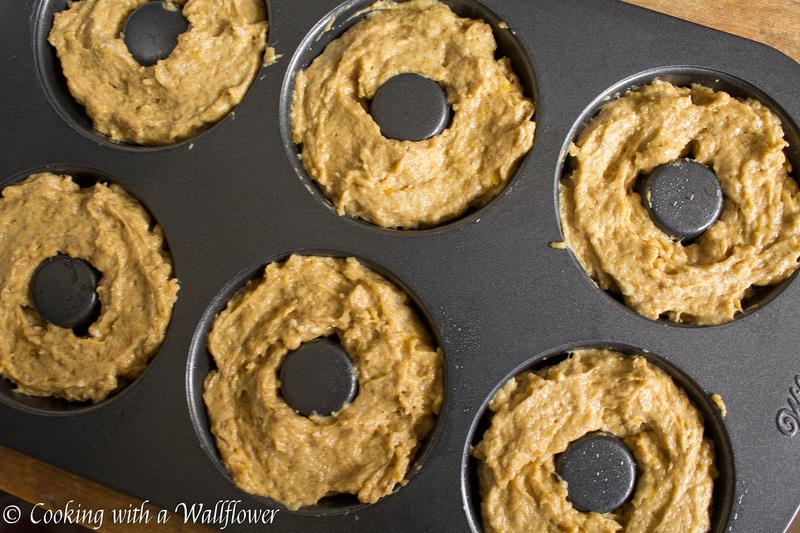 Muffins are thicker than doughnuts so it will take longer to be done. Bake the doughnuts in the oven for about 9-10 minutes or until the top is golden brown. Remove the doughnuts from the oven and allow them to cool for a few minutes. Once they are cool to touch, remove the doughnuts from the pan. 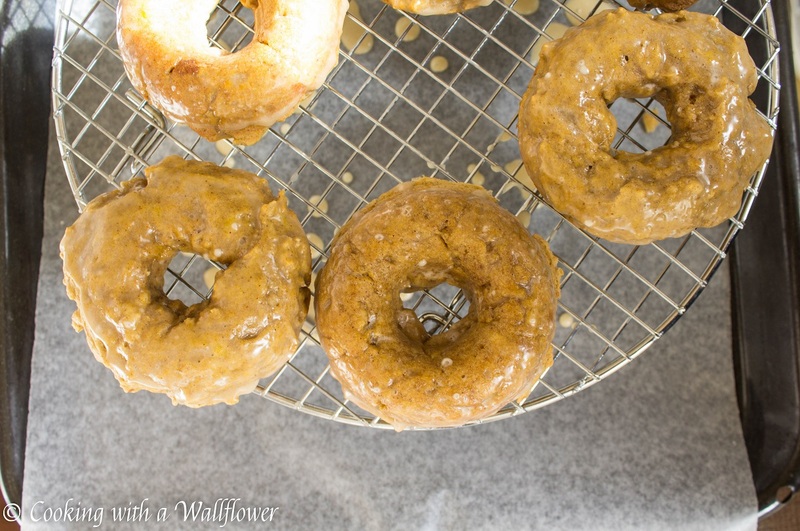 Hold the doughnuts on one side and dip the other side into the maple syrup glaze. I dipped about three times so that the glaze is nice and thick. The first dip will be very transparent. Once you are done dipping the doughnuts, set them on a wire rack to let the glaze drip and harden. Make sure to place either a baking sheet or a parchment paper underneath to catch the drips. 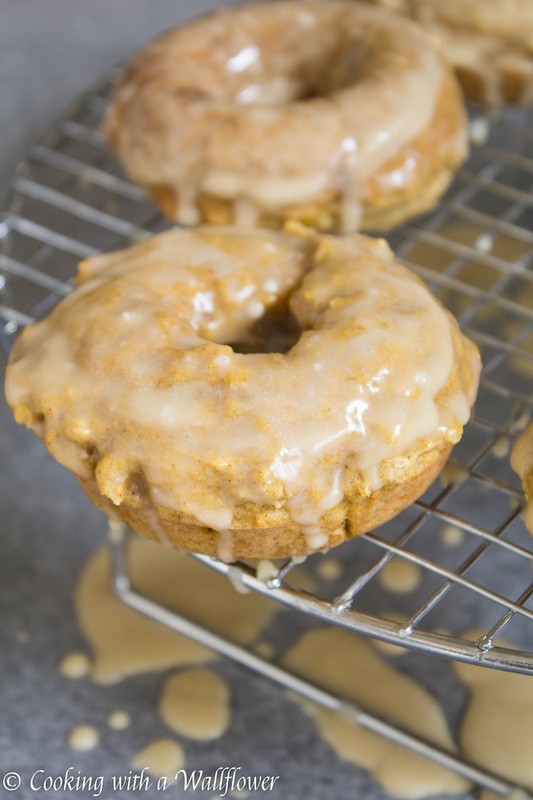 If you feel the doughnuts aren’t sweet enough, you can quickly whisk together the glaze and dunk the doughnuts in them a few more times. You can control how sweet these doughnuts will be. The first dip. It doesn’t even look like the doughnuts have much of a glaze, does it? After two or three dips. Serve the doughnuts fresh if possible. I personally think they taste better as soon as they’re made, but you can also store them in airtight containers at room temperature for a day or two. 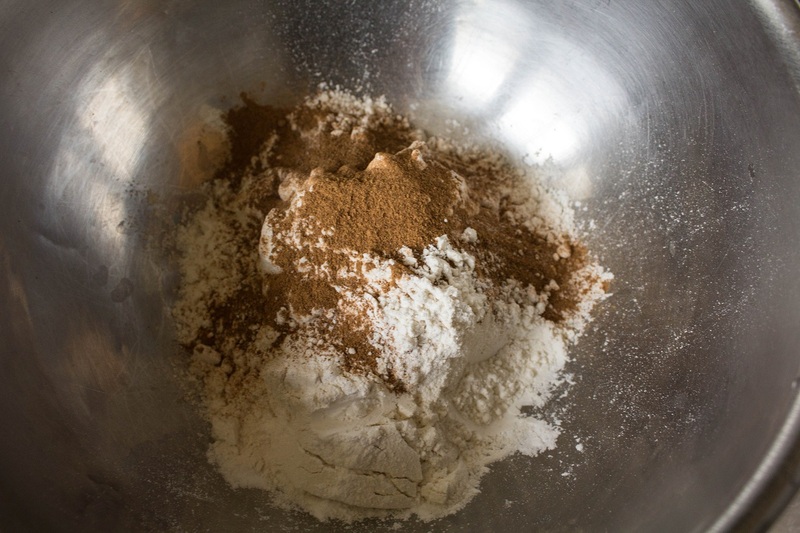 In a medium sized bowl, mix together all purpose flour, baking soda, baking powder, and pumpkin pie spice. In a separate bowl, whisk together the egg, brown sugar, soy milk, and pumpkin puree together until they become smooth. Add melted butter and vanilla extract, and whisk until they are combined. Pour the wet ingredients into the dry ingredients, mixing until they are just combined. Don’t overmix. Use a small spoon to place the batter into the doughnut pan, filling the cavities up to ⅔ -3/4 high. Bake the doughnuts in the oven for about 9-10 minutes or until the edges are golden brown. Remove the doughnuts from the oven and allow them to cool for a few minutes. Once they are cool to touch, remove the doughnuts from the pan. Hold the doughnuts on one side and dip the other side into the maple syrup glaze two or three times. Once you are done dipping the doughnuts, set them on a wire rack to let the glaze drip and harden. Serve the doughnuts immediately if possible. Doughnuts can be stored in an airtight container at room temperature for a day or two. This entry was posted in Desserts, Fall Cravings, Quick and Easy, Recipes, Vegetarian and tagged dessert, fall recipes, pumpkin, quick and easy, vegetarian. I’m dying from doughnut lust! Interesting and different recipe. Thanks for sharing it.